It is finally warm in Michigan which means it’s time to start breaking out your summer clothes and read up on this year’s trends. As I’ve mentioned in previous posts, while I don’t necessarily “abide” by trends, I like to take them and make them my own. 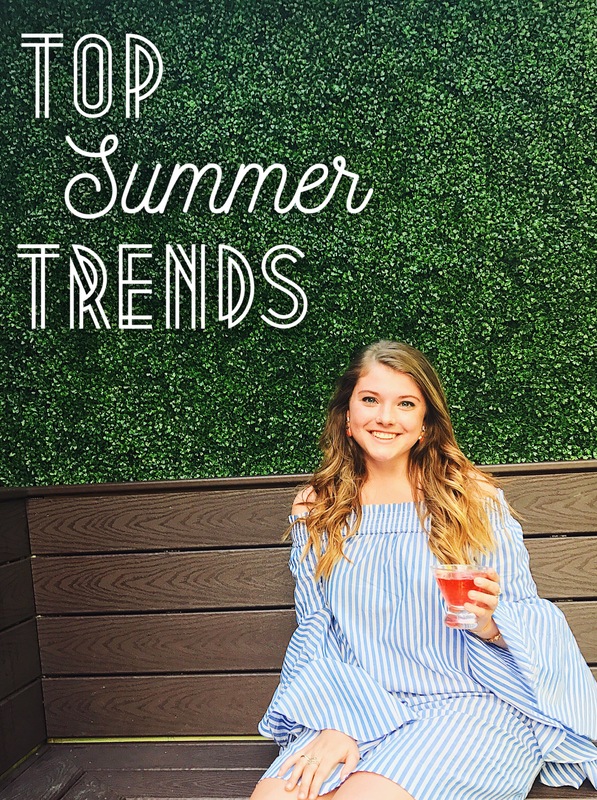 Luckily, this season has some of my favorite trends of all time and I can’t wait to work them this summer! Gingham // It’s no surprise, that one of my favorite classic prints is at the top of my trend list this summer. Generally it’s one of those prints that people associate with a more preppy style; However, thanks to the help of companies such as Zara, gingham is becoming more versatile like this Zara dress. Bell Sleeves // I’m LOVING this trend right now, and maybe spending a little too much money on it as well! Bell sleeves pair great with the off-the-shoulder trend that’s also in season. You can get both in this dress I just posted on my Instagram. PS – it’s SUPER affordable and currently on sale! Retro Swimwear // One piece and high-waisted bathing suits are back! I never thought I would be loving this trend as much as I am now. I recently purchased one similar to this one and I can’t wait to rock it on my upcoming vacation. Statement Earrings // The bigger, the bolder, the better. That seems to be the motto accompanying the latest jewelry craze. I’ve had my eyes on these tassel earrings and these bauble drop earrings both from Francesca’s. Wrap Dresses // Midi, maxi, mini, you simply can’t go wrong with a wrap dress. They work for any occasion, which is especially convenient now that wedding season is upon us. I absolutely adore this gorgeous pale blue maxi wrap dress from Asos. It’s definitely a possibility for my uncle’s wedding later this year. What are some of your favorite trends that you are trying out this summer?